The quacks are getting ready for the local festival, which means they are brewing their best potions. But the people of Quedlinburg aren’t the most discerning, and they care more about quantity than quality–as long as a potion fills the bottle, there’s less concern about whether it works. They like the appearance of a bargain, and you like the relief of not having to worry about effectiveness. 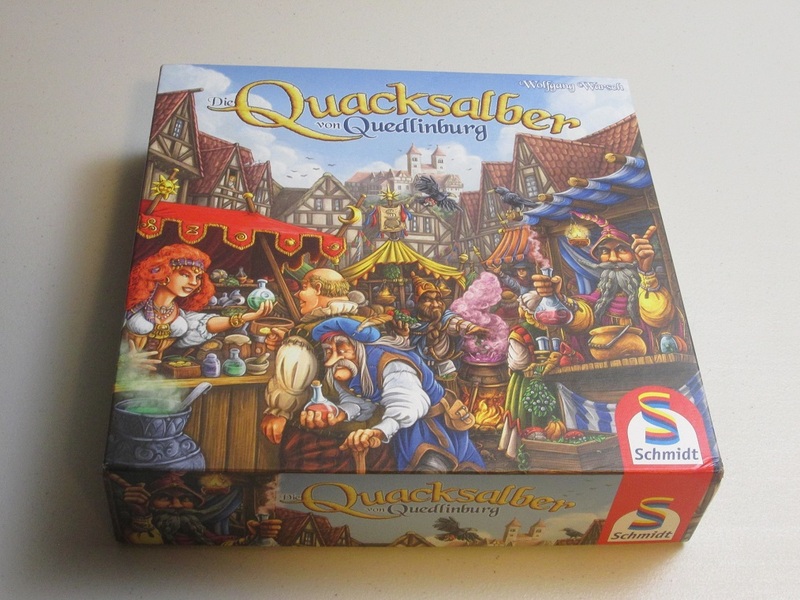 Put on your apothecary’s cap, drag out your best ingredients (and even some rat’s tails, if you need them), and strive to be the wealthiest quack in all of Quedlinburg. Note: This review is of the German edition, although aside from text on the components, it is identical to the English edition. 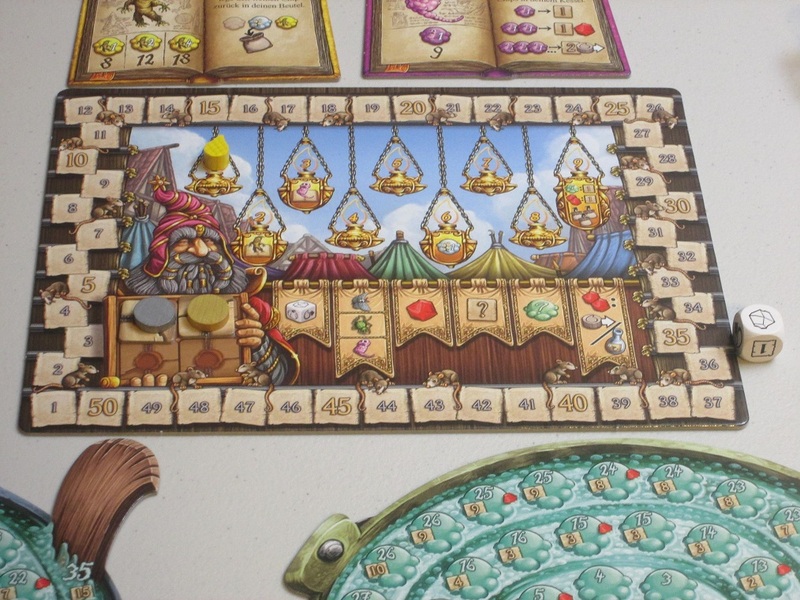 The Quacks of Quedlinburg is a push-your-luck bag-building game for two to four players. Players are quacks trying to brew the best potions ahead of the upcoming festival. The player with the most points is the winner. Quacks set up for two players. To begin, each player receives a cauldron, a flask, a bag, and player pieces of a color. 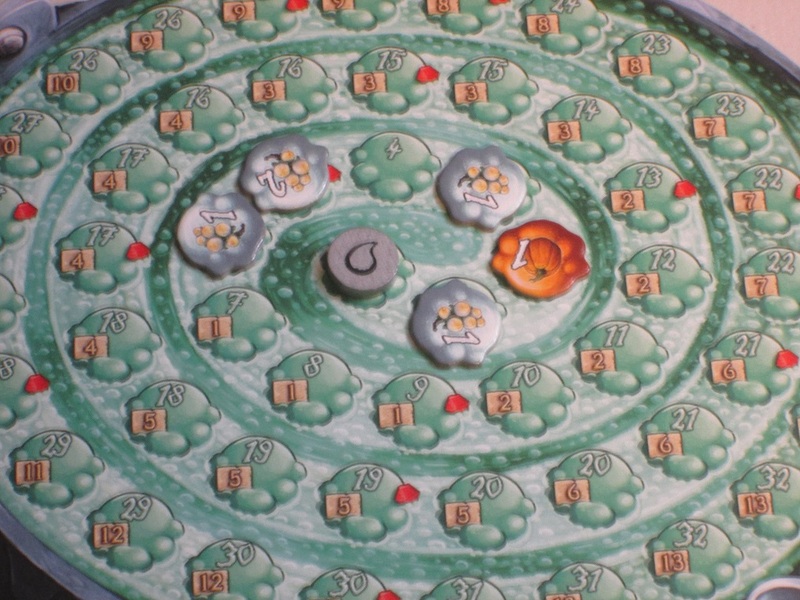 Players place their score marker and seal on the central score board and place their rat token, drop token, and flask on the corresponding spaces on their player board. They also take one ruby. Players take their starting drops and place them in their bags, and the round marker is placed on the score board. The books for each color of drop (save yellow and purple) are laid on the table, displaying the powers and costs of each kind of drop. The player who last cooked something is the start player. The game is played over nine rounds, and each round follows four phases. In the fortune-teller phase, the start player for the round reveals and reads the top card of the fortune-teller deck, affecting the rules of the round or granting an immediate bonus. In the rat phase, players place their rat token in their cauldron a number of spaces in front of their drop based on how many rat tails separate them from the point leader. In the third phase, players attempt to brew potions. Players simultaneously draw drops from their bag and add them to their potions, executing the special ability of each drop (if applicable). The more drops players place in their potions, the more valuable those potions will be, but also the greater potential the potion will have of exploding. (If a player ever has white drops in their potion of a total greater than 7, the player’s potion explodes.) Players stop when either they decide to stop drawing drops or their potion explodes. The space after their last drop determines how many points they will receive and/or how much money they will have to spend on new drops for their bags. The score board is clearly laid out, and in addition to tracking players’ scores, it offers useful reminders. Once everyone has stopped drawing, the rewards phase happens. The player whose non-exploding potion is the most full rolls the bonus die and collects rewards. Then players earn bonuses for end-of-round drop abilities and collect rubies for their scoring spaces. In turn order, players collect victory points and/or buy drops for their bags. (If a player’s potion explodes, the player must decide between points or drops; otherwise players do both.) Finally, players may pay rubies to advance their starting drop (making it easier to fill their cauldron) or to refill their flask, which when used allows them to place an immediately drawn white drop back in the bag. The start player passes around the table with each round, and at the start of rounds 2, 3, and 6, new drops enter the game. The game ends after round 9. The player with the most points wins. Strategy games that employ heavy luck elements are difficult to get right. If there’s too much luck, player decisions matter less, eliminating the need for strategy, which can be a non-starter, especially if they run too long. That’s why most games that involve heavy press-your-luck decisions are shorter, lighter fare. If Lady Luck isn’t smiling on your endeavors, at least you’ve only spent fifteen minutes or half an hour; it’s easy enough to move on from there. 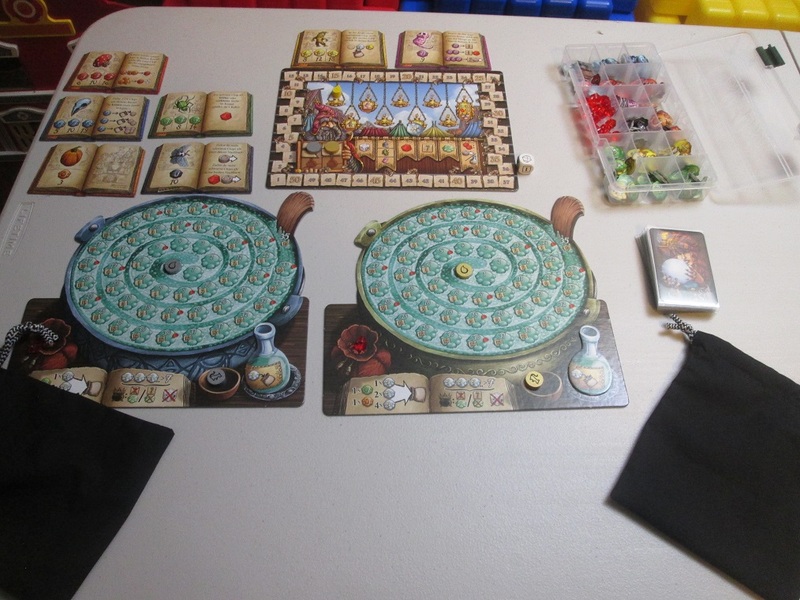 The Quacks of Quedlinburg (henceforth “Quacks”) is neither short nor particularly light and yet it boldly leans into the luck inherent in deck-/bag-building games by crafting a game around pulling the right chits at the right time. And your comfort with luck and risk in games will likely determine how you feel about it. 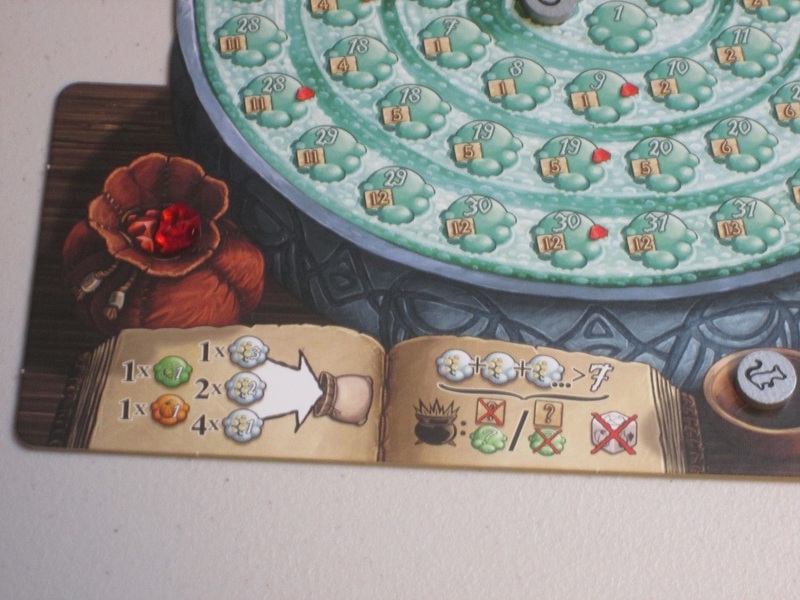 For my part, press-your-luck and risk management games are some of my favorites, so Quacks tastes just right to me. 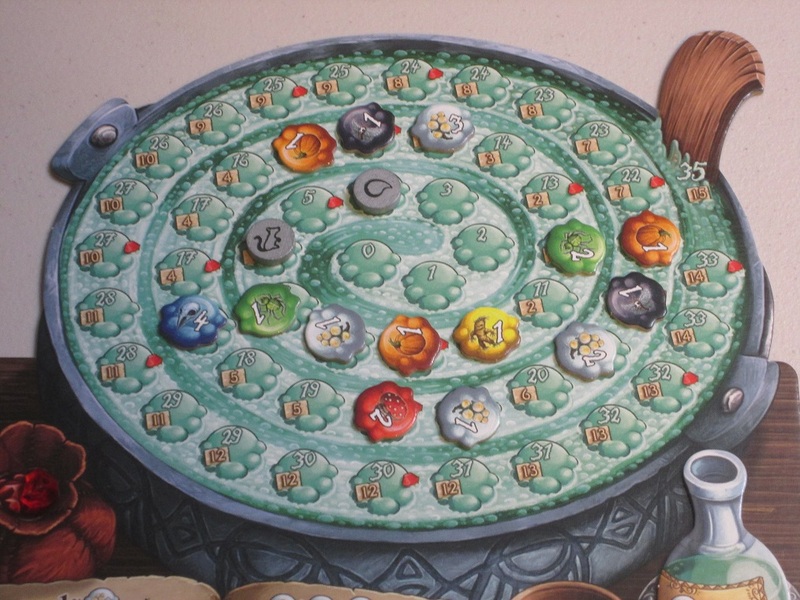 Each player board has a convenient aid, showing which white chips are in the bag and also a reminder of when a potion explodes. When I first read the rules to Quacks, I was less worried about the luck involved in pulling chits from a bag and more skeptical that the press-your-luck decisions would be interesting enough. You only bust when your white chip value exceeds 7, and all of your white chips total just 11 at the start of the game. It seemed to me like it would be pretty easy to avoid going bust, especially as the game goes on and doubly so since most of the white chips are value 1. But the actual experience of playing Quacks changed my mind. There is quite a bit of tension in drawing chips in Quacks. Part of this is because while there may not be a probability of going bust at any given moment in Quacks, there’s usually at least a possibility, and it’s that possibility that provides the tension. Your white chip total may be at five, let’s say: a 2 and three 1s. That means there are three white chips left in your bag: a 3, a 2, and a 1. That means only one chip has the possibility of making you go bust. But at what odds is it worth it to draw another chip? If there are ten chips in the bag? Six? Five? What if you draw the white 1 next, making it possible for two chips to make you bust? The game involves constantly calculating and recalculating your odds, determining whether or not to go for another pull. 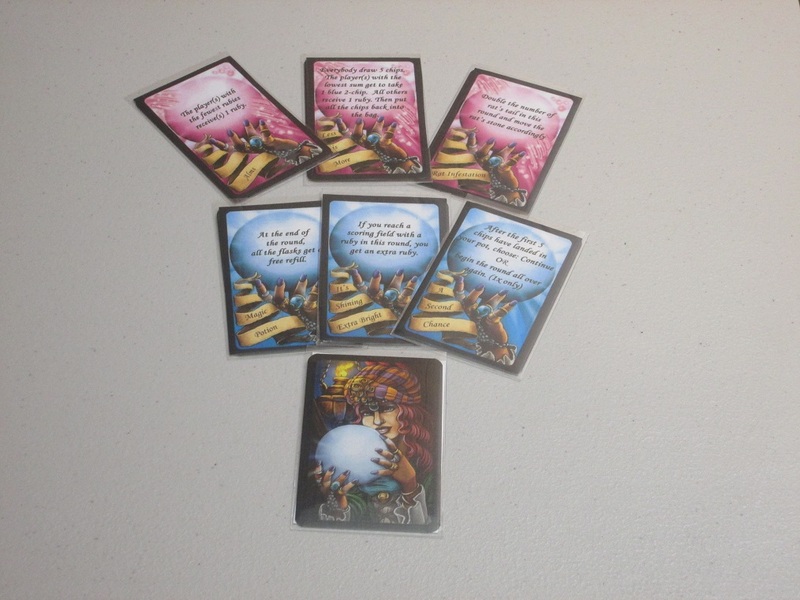 Fortune-telling cards change up the game from round to round and game to game. There are enough of these that you likely won’t see the same cards in every game. The exciting thing here, as in most games involving risk assessment, is that probabilities are always guidelines more than strict laws. In a recent game, I had eleven chips in my bag, only one of which would make me go bust. I thought my odds were good enough to chance it, yet I drew the chip that made me go bust. That was frustrating, but it’s hard to get too upset: I knew going in that, while my odds of drawing that chip were low, it was still a possibility. I don’t like fantasy sports very much because they assume rigidly, based on statistics, how an imaginary game would go. “On paper, this is the most likely outcome.” Yet anyone who has watched any competition will tell you that the reason we watch competitions instead of just managing spreadsheets behind the scenes is that people will surprise you. Outcomes are never certain. A team with a much smaller budget can beat the flush-with-cash powerhouse. A young shepherd can defeat a trained-for-war giant. A hobbit can cause the unmaking of the One Ring. I don’t mean to say that Quacks is as grand in scale as any of those things, but uncertainty is a powerful generator of excitement, and Quacks rightly hitches itself to that horse. 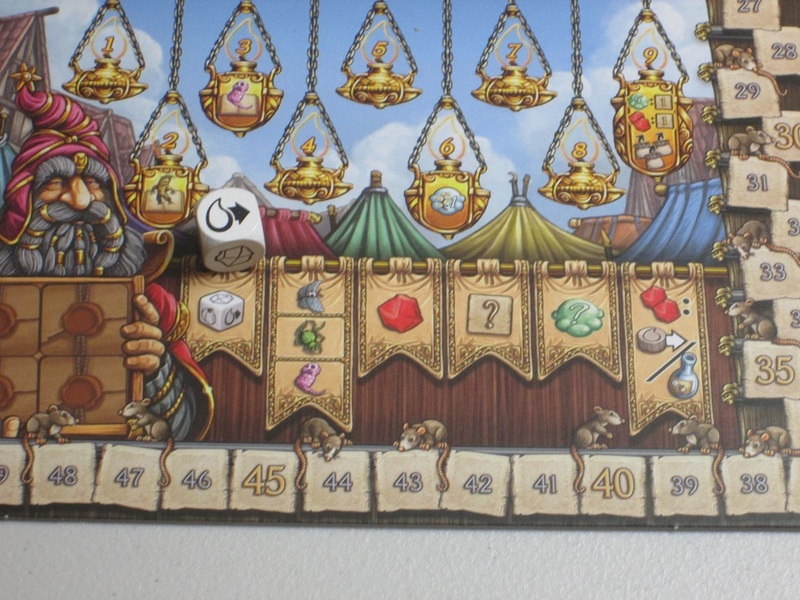 But more than just uncertainty, Quacks is one of those rare press-your-luck games that is also a strategy game, joining other successful titles in this genre like Ra and Lords of Vegas. Part of what makes the strategy/luck combo work so well in Quacks is the ease with which you can calculate your odds. Players are never in the dark about what their chances are. While they are never permitted to examine the contents of their bags, there’s a helpful reminder on each player’s board about the pesky white chips. You always know how many of those there are; you can always see which ones are already in your pot; you can always count how many total chips remain in your bag. So while you can’t know which chip is coming next (without cheating), you can always make an informed decision about the risk involved from pulling it out. Sometimes the pull will go your way; sometimes it won’t. But you are fully in control, and while you might curse your luck, the person truly to blame is the grab-happy player. Of course, I say this, and I know there are some people reading this who are already thinking several spreadsheets ahead, and wondering about what happens if their luck is spoiled every round, and so on. If you’re in that camp, Quacks probably isn’t for you. Because as much as the game is about strategy, it’s more about the excitement of play. The heavy luck element may not make the game “fair” in the sense that wound-tight, balanced Euro games are “fair,” but that’s not Quacks’s main objective. Its objective is to delight players with interesting combos and a little gambling, and at that it succeeds tremendously. The books that are part of set 1. Each book includes a description of what the drop does as well as costs for each level. 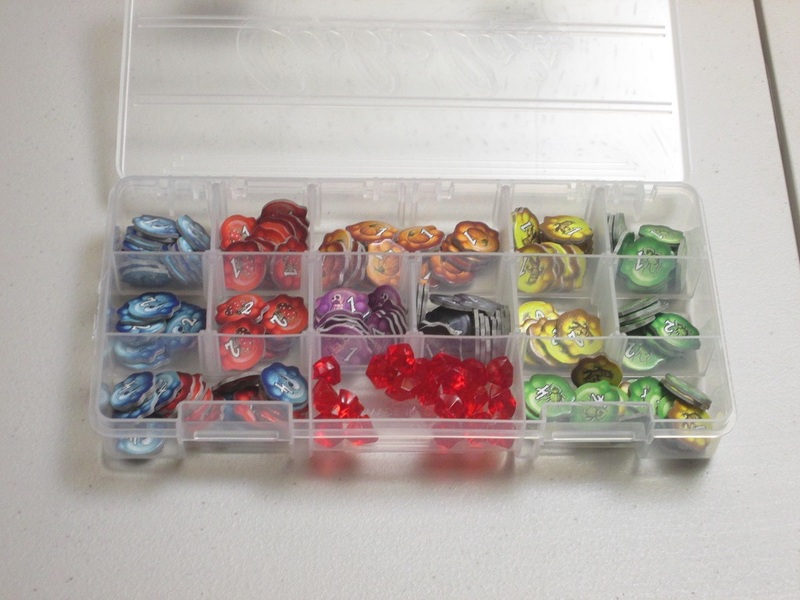 This is a clever way to reuse components and still offer variety. And, of course, saying that the game isn’t “fair” or “balanced” in the traditional, even-playing-field Euro sense doesn’t mean it isn’t fair or balanced. Quacks is quite clever in the many ways it serves to mitigate luck. The first way it serves to mitigate luck is through the players’ own purchasing decisions. Each round, players may choose to purchase new chips to add to their bags based on the contents of their cauldron for this round. Players are in the driver’s seat deciding which chips to buy and which combos to pursue. Just in book 1, you can add red and orange (red move farther the more orange you’ve already drawn). You might add yellow chips, which throw white chips back in the bag as long as they’re drawn right afterward. You can focus on blue, which allow you to preview the next chip before adding it to the pot. You can go green, which might net you rubies if they come out last. Or you can go purple and black, which have the potential to net you cool abilities depending on how many you’ve drawn (and how many your opponents have drawn). None of these things is a certainty, though: you might add red chips and not draw your orange. You might add yellow and not draw them after white. You might draw green early in the round or not draw your blue at all. Your combos might not go off the way you planned, but you are in control of at least the possibilities that happen. 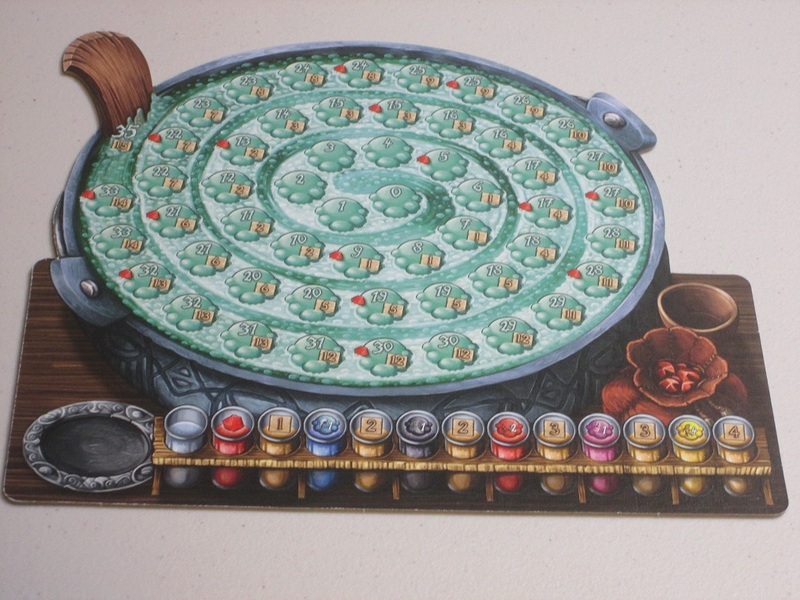 In addition, each round the players farther back on the score track have their potion “pre-filled” with rats to give them a small boost in the round. Usually catch-up mechanisms are frowned on, but in a game that strives to harness luck, this is brilliant. If you have a bad round, you have to choose between buying new chips or taking points. If you buy chips, you might be in a better position in the next round if you fall behind in points. I’ve played several times now, and only once have I felt that the rat tails gave an unfair advantage (and in that instance, the player who benefited most still didn’t win). I also like the infusion of luck in the form of fortune-teller cards. A new “event” happens every round, and these can force players to reconsider settled conventions. You might get an event that makes busting much worse or not as bad, forcing players to adjust their drawing accordingly. Or each player might get to choose a bonus of some kind. Or rat tails might be doubled one round. Or you might get a mulligan if your round doesn’t start out well. These add just enough flavor to the game to keep it from becoming stale over the course of nine rounds (which are needed for the luck to even out over the course of the game). Should you keep drawing? For how long? And speaking of variety, Quacks, like the best deck-building games, gives you many, many options right in the box. Most of the drops have four potential costs/abilities, and while there are four suggested starting sets/combinations, it’s easy to mix and match. In addition to this, player cauldrons are double sided, with a simpler and a more advanced side. This is a great way to stretch the game’s fairly simple components into several modes of play, and if you like the basic premise of the game, there should be plenty of possibilities in the base game to keep it fresh. I’ve played several times using the first set of ingredients and another time with set two, and those two sets are interesting enough that I could easily play the game another ten or twelve games plus without additional variety. Unlike Dominion, say, where the joy is being thrown into different combinations of cards, in Quacks, there’s enough uncertainty inherent in chit pulling that even the same set is interesting again and again. One or two sets, in other words, would have been enough. The fact that the game comes with so many potential combinations feels like a gift, and the possibility of having even more combinations is a wonderful boon to the game. With a deckbuilding game, expansions require new cards, often lots of them, to be worth it. Here, expansions could be as simple as single cardboard slabs–all you need is the new book slab to detail the way drops are used because the drops remain the same no matter which books are on the table. 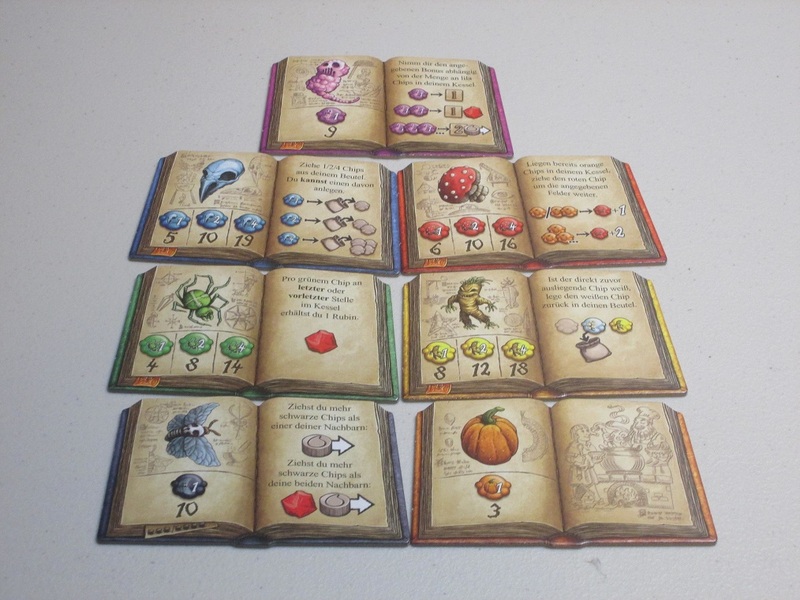 Each board is double-sided, and the back side offers a slightly different way to play. The components in Quacks are mostly good. The cardboard is thick enough, and the drops (which are handled the most) have stood up to play so far, although they aren’t as thick as the chips in Tasty Minstrel’s Orleans. They do the job, though, and aren’t close to wearing out. My only real complaint about the game is that the wooden player pieces don’t match the player colors. This is annoying, but it’s not a huge deal. Once I point this out to new players, they adapt quickly to identifying players by their wooden components. This was a nice brew. 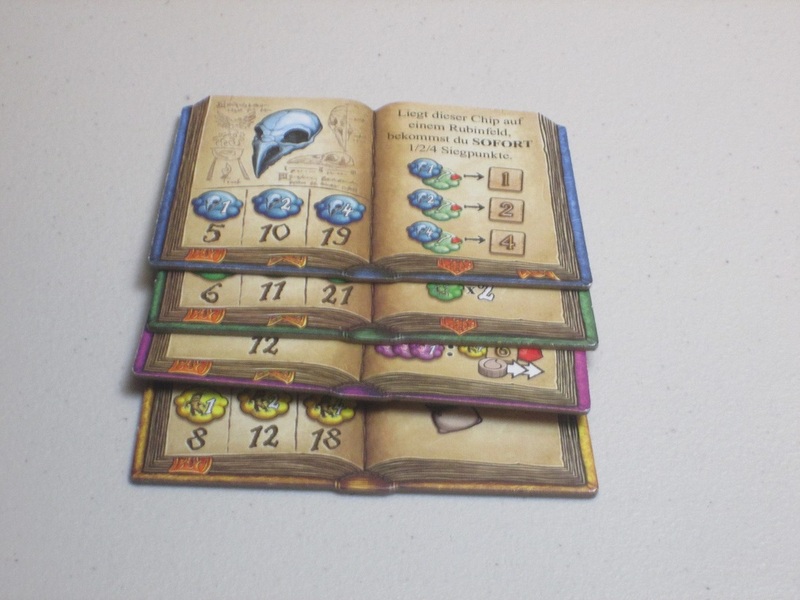 This game does have German text on the fortune-teller cards and ingredient books, but there’s an official rules translation online, and there are even paste-ups available for the cards. (Note: the US version was released in late 2018.) I took German in high school, but with the English helps already available, I didn’t have to rely on it to feel comfortable with the game. The rules of the game are fairly straightforward, and while it may look overwhelming to casual players, once they overcome the hurdle of the first round, they’re usually up to speed. I would say this is no more difficult to learn than the Dominion base set, so it seems ripe for family play. The box says the game takes 45 minutes, and that’s fairly accurate. I’ve played this mostly as a lunch game, and even with teaching, it has consistently fit within the lunch hour. The handy tracker on the scoreboard makes the rewards phase much easier to track. I originally wasn’t going to import Quacks when it was nominated for the Kennerspiel des Jahres, as I thought it looked okay but not great. I thought it would be easy to resell if I didn’t, and that’s what pushed me over the line. I’m so glad I ended up getting this one, because it’s an excellent game right now, and it has only gotten deeper and better with more plays, and I expect it to get still better as I explore it further. It joins the upper echelon of luck-driven strategy games, and it’s one I’m consistently eager to play, win or lose. This game isn’t snake oil; it’s the real deal.